For a French Country design that’s so heavily based on tradition and cultural nuance, sometimes it’s the smallest details that lend the most authenticity. For those who don’t want to install a freestanding bathtub or even get a new bathroom vanity, a good place to start is the hardware. 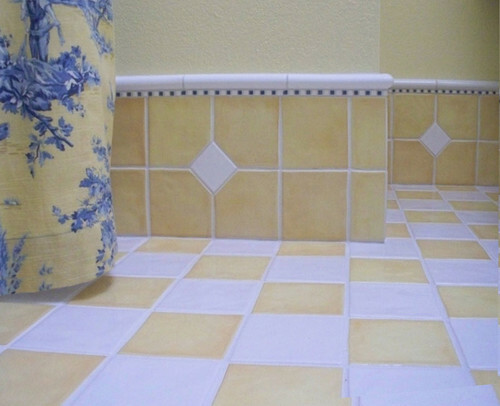 HomeThangs.com introduced a tip sheet to the consumers for picking the right product and getting the desired look of a French Country bathroom. 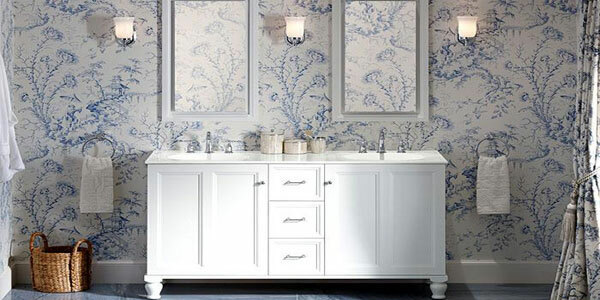 HomeThangs.com – the Home Improvement Super Store has all the fixtures and décor to design the perfect French Country style bathroom. If redecorating rather than doing a large-scale remodel, new paint, new towels, and maybe a new shower curtain are probably at the top of the list – and that’s a great place to start. But the budget is only limited to one other thing, it should be the bathroom lavatory faucet. Not only is it something everyone that enters the bathroom will use, the faucet also occupies a central (and visible) location. 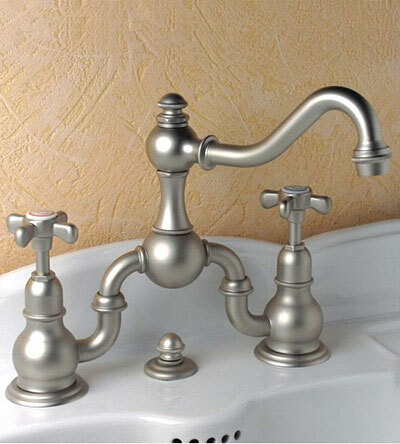 So while any old faucet will work functionally, opting for a historical-style cross handled faucet, like the Wall Mount Royale Faucet by Herbeau for example, especially in an antique finish, is an easy way to add character and personality to the French Country design bathroom. 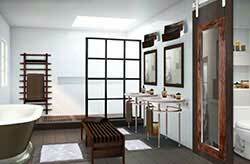 A qualifier: while historically inspired faucets are great, there’s one regard where one does not want authenticity. If living in a historical home, or if salvaged a great antique pedestal sink, one might be tempted to go with the traditional two-tap faucet, but there’s a reason modern mixers were invented. To save oneself from having scalding hot water on one side and icy cold water on the other, it is important to look for something modeled with a historical eye, but a modern mentality. For example, Royale Faucet from Herbeau has a more-traditional French Country design (and visible) mixer connecting the two taps, nicely combining a modern convenience with an eye-catching period style. 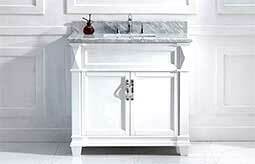 Installing a new French Country design bathroom faucet is a matter of some simple elbow grease. Installing a new tub spout, handles, or even a full shower system can be a little more complicated, but are definitely still worth considering. 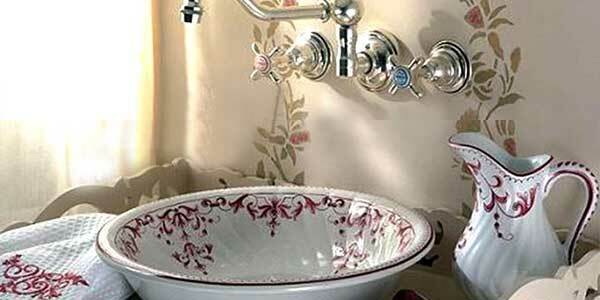 Just as with the bathroom faucet, there’s a wide array of period-inspired shower sets on the market that will add a beautiful French country flair to the bathroom. If on a limited budget, the Perrin & Rowe Shower System from Rohl is admittedly maybe not the best place to spend the dollar (unless the existing bath fixtures are very out of date). But choosing a deluxe shower system not only helps round out a French country bathroom design, but also is a great way to easily and (more or less) inexpensively add luxury and functionality to the existing setup. Good, antique styled shower systems can range anywhere from $600 to $6,000, so it is helpful to keep an eye out for ones like those from Elizabethan Classics for example, which offer a similar style at a lower price. This might seem trivial, but the devil’s in the details, and changing out the toilet trip lever is a detail that’s easy to overlook. Swapping to something vintage looking not only adds that little bit of extra charm, but because it’s oft-used but rarely decorated placement, it will draw attention and add a real French country flair to the bathroom. It can be done easily and inexpensively, but will make a relatively large impact on your design. 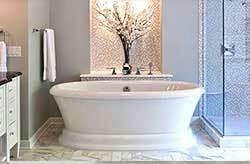 Mediterranean Bathroom by Johns Island Design-Build Firms Solaris Inc. 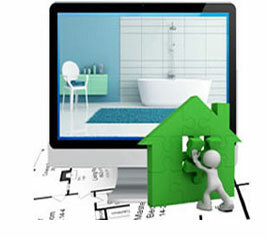 In addition to paying attention to the little details, one also should be thorough about remodeling them. That means bathroom accessories: everything from a soap dish and toothbrush holder to a towel bar and shower curtain rod. These are the nuts and bolts of good design, and while they cost a mere fraction of what one would spend on swapping to a clawfoot tub, the right choices here can give the weight of French country design to even a very basic bathroom with less expensive fixtures. Design is about flair as much as furnishings, and choosing the right accessories will significantly dress up and alter the bathroom decor, without any major construction or even expense. 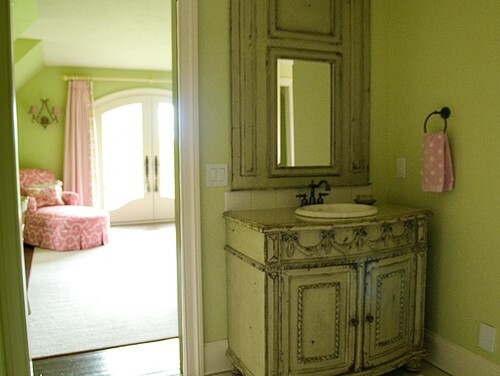 While on the slightly more expensive and slightly more involved end of the spectrum, changing out the is a great way to help transform it into a French country bathroom. 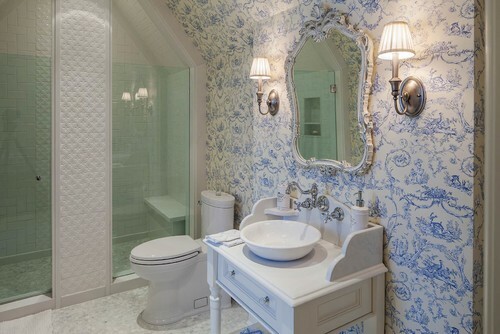 There are a million kinds of lighting fixtures out there, but like bathroom faucets, the “automatic” choices for the bathroom (like a bar above the mirror, or the old fashioned dressing table globe lights) aren’t particularly interesting. 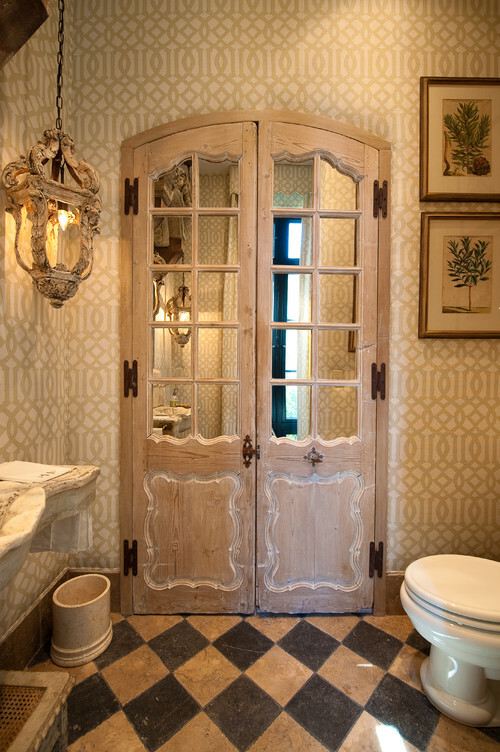 That’s why choosing a dramatic light with a lot of personality, like the Royal Sconce from Crystorama for example, will make such a big difference – it’s eye catching, unexpected, and the antique styling and an aged finish wil add an air of tradition and authenticity that make a French country bathroom come alive. HomeThangs.com is not only a home improvement superstore, it also provides expert design tips and a comprehensive shopping guide, taking the ideas from professional interior designers, and offering tips to the consumers on how to pick the products to best suit their needs.